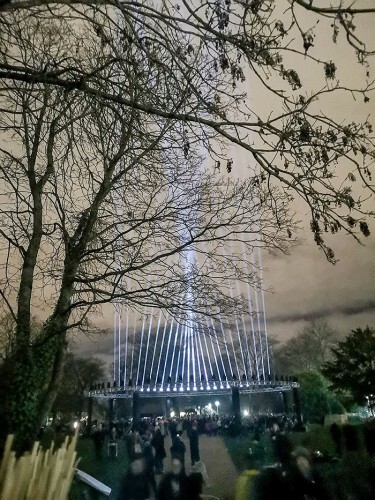 The structure and form of the ring of lights was inspired by the impressive architecture of traditional gas holders – an important industrial artefact of the gas-powered age, much loved by many – whichh are fast disappearing. The light source is a 440W HRI which the optics help make extremely bright, and it has two colour systems, a fixed wheel with six dichroics plus open and an adjustable colour temperature between 3200K and 7000K, as well as linear CMY colour mixing, all of which ticked the right boxes for this application which only required white light. 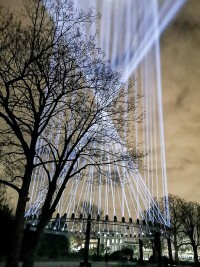 The pre-programmed movement of the lights was controlled via bespoke software developed by Adam Heslop with playback utilising the TouchDesigner platform. This was triggered by timecode and the Art-Net flow fed into a ChamSys lighting control console to establish the offset movements, so the DMX values received by the lights remained continuous and in unison. 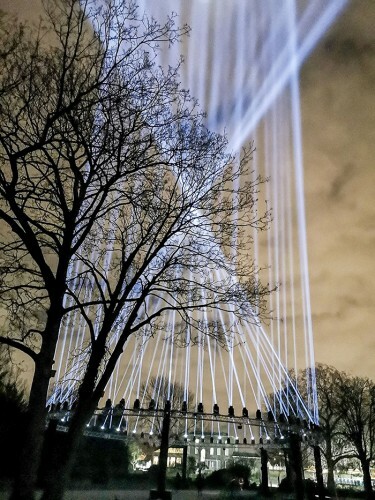 The light beams piercing the night sky started off the show as messy and unpredictable ‘mumurating’ into angular and ordered slices of luminescence. They subsequently became more random again, with sequences resembling birds frenetically building a nest then morphed into massive beautiful spirographic circular beam motions, twisting and curving intricately around one another. 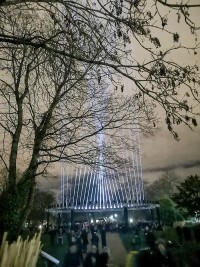 The “Welcome to the Forest” event ran from 5:30 to 9pm for three days and the 15-minute Nest show ran every 20 minutes on a partially manually operated loop. A trail of small illuminated sonic globes – which also emitted sounds – guided people through the park to find the exact spot. 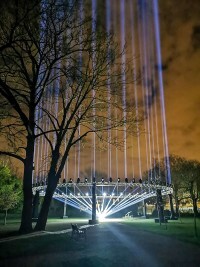 For the best results people could sit, stand or lie down in the middle of the circle, see the lighting and hear and feel the three-dimensional sonic murmurations. Attracting massive interest, Nest was enjoyed by an estimated 35,000 people, and such was the popularity of the artwork that organisers had to limit the numbers inside the trussing circle at any one time to ensure all received the optimum experience.